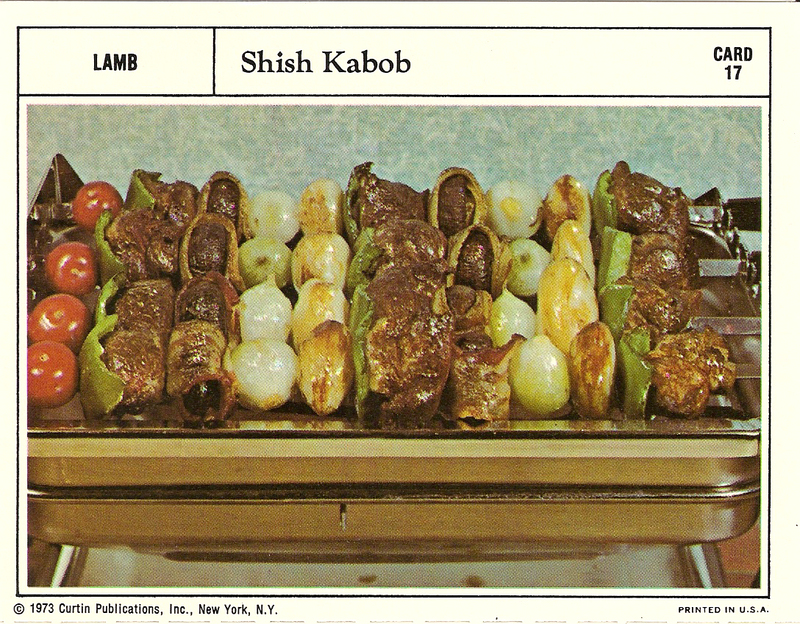 tags: bad food photography, shish kabob, vintage recipe cards, who uses canned boiled potatoes? For the most part it is hard to fault this recipe – it’s got meat, veggies, and bacon – but seriously, canned boiled potatoes? Really? Marinate lamb cubes overnight in sauce made of salt, pepper, garlic, thyme, marjoram, oil, wine and Tabasco. To prepare: thread meat on skewers, alternative with tomatoes, mushrooms wrapped in bacon strips, onions, potatoes and green pepper. Broil in an electric broiler , oven at 500° or on a barbecue, placing skewers on a rack 3 inches from flame. Turn and baste frequently until done – about 20 minutes. © 1973 Curtin Publications, Inc. New York, N.Y.